I’ve a new story out! 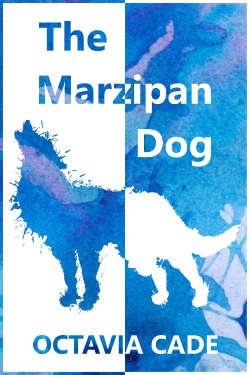 It’s called “The Marzipan Dog“, and it’s up at Visibility Fiction. Visibility, as its title suggests, likes to focus on stories with under-represented protagonists. In this case, my main character is disabled. Beth is blind, and she’s got a weird, shape-shifting guide dog who absolutely adores her. Which would be great, if he weren’t using his powers for evil (or is that good?) and scaring off everybody else. Usually the Marzipan Dog sat by her in class, sat silent at her feet and snoozed, and sometimes she had to nudge him with her foot when he began to snore. She didn’t like it when he snored, because there were girls sitting next to her who would make fun of him, make fun of her. They always did, and always just loud enough so that they could be heard by Beth and Beth alone. And one day they started up again, and the Marzipan Dog was not asleep, and his weight on her foot changed, became cooler and harder and had the press of scales against her bare leg and the stench of salt water and mud rose up about her and there was screaming then, and shrieking, and the thump of feet on the floor and then the teacher was beside her, soothing and gentle and fur was soft against her leg again and the Marzipan Dog panted at her knee, panted happily and with satisfaction.